Today I'm super excited... Why, you might be wondering??? Well...as a result of me recently reviewing some St Grape skincare products, St Grape have kindly asked if id like to host a giveaway on my blog, where 5 of you lucky girlie's can win St Grapes best selling Aqua Bliss Bath Scrub, of course I jumped for joy as I'd love for some of my lovely followers to win something I reviewed myself and that I love so much. If you haven't heard of St Grape before they are a Canadian brand that specialise in producing natural skincare products which are all handmade using the ancient processes, pretty cool huh!!! Also If you have sensitive skin there really is no need to worry as St Grape promote healthy skin so their products will help sooth and condition dry sensitive skin including eczema and psoriasis. If you want to see my full review on St Grape including the Aqua Bliss Bath Scrub that's up for grabs, then feel free to click here to have a peek. 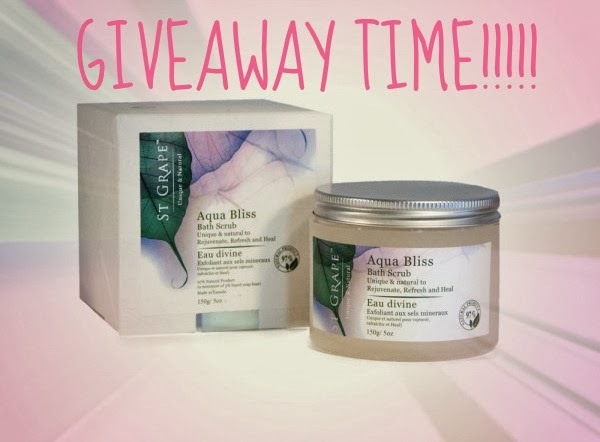 The giveaway will be run for approximately 20 days and is open worldwide, then the 5 winners will be auto-selected at random by the software (RaffleCopter) and your prize of a St Grape Aqua Bliss Bath Scrub will be sent out to you asap, just in time for Christmas!!! What a treat!!! I'll also love you forever if you could give me a little follow on GFC or bloglovin whilst this giveaway is live, thank you soooo much!!! Nope, not yet :) Should I email you my address? Sorry if I bothered you.